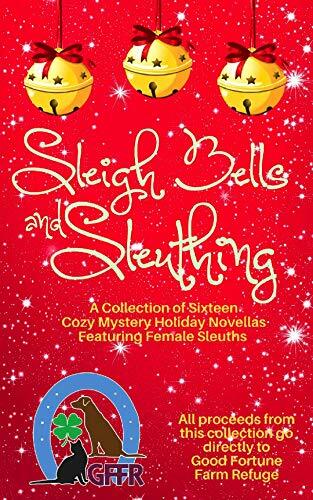 I’m thrilled to be one of the 16 mystery authors in the 991-page anthology SLEIGH BELLS AND SLEUTHING. This book is available for only a limited time, and every penny of the royalties go to Good Fortune Farm Rescue, a no-kill shelter that helps homeless felines, canines, and equines. All 16 bestselling authors have given their time and wrote stories tied to their popular series–my contribution is a Christmas Organized Mystery. The editor & proofreader donated their time, and the formatter did the job for free too, as did the cover designer. We want every nickel to go to help the animals, and you can help too. If you like fun cozy mysteries, check out this anthology, buy a copy if it sounds good to you, and tell a friend about it. The best kind of book marketing is via word-of-mouth, and we hope to get a lot of people talking about this anthology. The book is exclusively available on Amazon, and is in Kindle Unlimited, too. So if you have a KU membership, we hope you’ll choose this book as one of your free reads soon.